So how many of you have noticed that the terribly named "Oh My Yog!" isn't on store shelves anymore? I did because it was pretty much my favorite yogurt of all time (except maybe Columbo's Smurf yogurt). I have no interest in the greek or tangy yogurts out there, though I will eat them on occasion (I'm looking at you Chobani Flipz). I want sweet yogurt and oh is it hard to come by nowadays. The good news is that while Stonyfield may have cancelled Oh My Yog!, they did put something else in it's place. With talk of cream on top (like OMY), you can't help but wonder if maybe this is coming off the same production line or maybe it's even the same thing with just a new coat of marketing. It even has the inner label markings that you can read through the clear plastic container, just like OMY. The picture of five you see above is actually my second go through of these flavors. They are just a dollar a piece at market basket, so I was trying each one individually at first, but then decided to pick up all five for the purpose of this post. The first of this bunch I ate was strawberry. I thought the OMY strawberry was too flat and this definitely has more flavor. Next up came the cherry vanilla which is definitely growing on me. It's got a bit of true cherry bite but the vanilla helps keep it in check. I'd grab this over the strawberry whenever I was in for a little more pop to the flavor. While the new strawberry is better than the old strawberry, the new vanilla doesn't have the same pop as the old vanilla. It's not bad, but it does have a bit of yogurt tang to it (which comes across a little strange because of the sweetness and liquidity of the yogurt). I'd much rather have the cherry vanilla I had yesterday. I don't know if I'll ever enjoy the potentness of maple mixed with the tang of yogurt, but this whole lineup isn't very tangy, and with the edition of granola, I made it through the maple flavor ok. I doubt I would buy it again, but some people like maple yogurt right? I don't really remember liking the chocolate the first time, but I will be back tomorrow to put some thoughts in about this round. The moral of the story is that this isn't as good as Oh My Yog, but it's better than the alternatives and technically it is cheaper than OMY. The saddest part (besides the more loose texture) is that there is no apple or pear flavors which were my absolute favorites in the OMY lineup. Maybe someday they will return. Has anybody else tried these? I'm with you, I was a huge fan of the oh my yog lineup, not so much of the name. The vanilla and the pear flavors we particularly outstanding . Haven't seen these in stores yet, might try. I don't know about where you live, but these have been around in my local stores for as long as I can remember. Aside from coffe and chocolate, I can't recall them adding new flavors. There are lemon and peach brown cow though, might be more your thing. Or Noosa, if you can find it. It's not runny and comes in a ton of flavors. 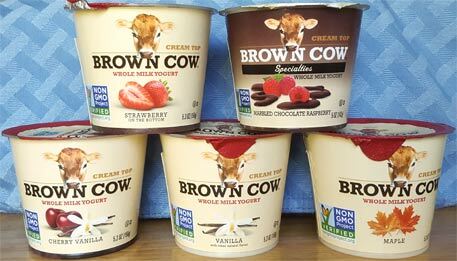 I love Brown Cow yogurt; coffee has been my favorite for years! This isn't a new brand, though, it's been around for a very long time. My apologies, I should have done more research. It was just such an odd coincidence that it was made by stonyfield and was in the exact same spot on the shelf. They definitely seem to be rocking new branding though right? Brown Cow isn't organic, Stonyfield is. That's a huge difference for me as I will only buy organic dairy products these days. I realize they are both owned by Stonyfield.